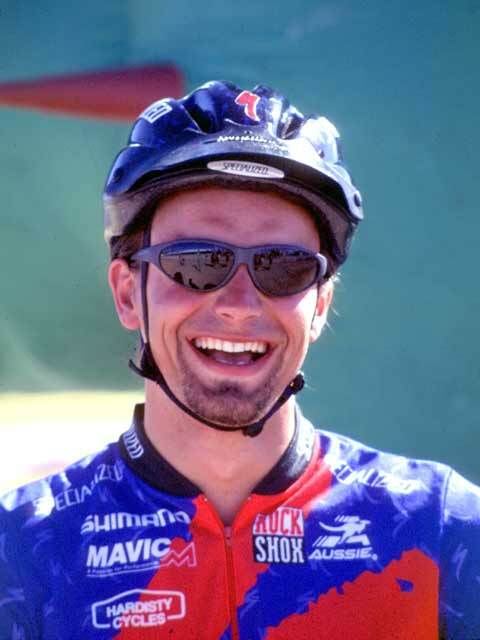 We all have our cycling heroes and Jason McRoy was one of mine. Back when I started riding there was no internet, no video on demand and no easy way to catch up on the latest in off road cycling news. We were lucky, we had MBUK, the cycling magazine aimed at UK riders. Many of us were avid readers, I remember cycling down to the news agents every month to get my fix. Jason was born on Friday November 26 1971 at 8.10 pm, in the Luton and Dunstable Hospital in Bedfordshire. He was diagnosed with a hole in the heart at an early age, but at the time nothing could be done about it. He spent his preschool years living in Canada and America, returning to the UK in time to start school. Medical test showed that the hole in his heart was starting to close up, so his parents encouraged him to take up more physical activities. It was in middle school he discovered the joys of cycling and really took to it. After his family read about an indoor BMX race in the Crowtree Centre at Sunderland Jason decided to enter. . He had a sort of BMX at the time, the type that proper riders turned their noses up at and on this ‘honk’, as the other riders in his moto called it, he proceeded to thrash the pants off everyone in the race until the other lads wised up and took him out of the running for first spot with beautifully- executed ‘tactical’ riding. This was the start of things for him, he soon became obsessed with riding and all things related to it. At the age of eleven, he was on the verge of joining the Mongoose Factory BMX team until an accident nearly ended his cycling future. After crashing during practice at Dunston another rider landed on his knee, tearing and twisting the underlying tissue. Jason immediately had an operation on it, but the private specialist the family saw said there were only two real options, carbon fibre inserts in the ligaments or a long series of high intensity workouts, although these were designed for adult athletes not children. The doctors did not think it was unlikely that a child could maintain such a high pressure workout programme, but Jason did. Even with these workouts Jason could not cycle, so tried his hand at other sports such as running football and squash, but never really had the enthusiasm for them that he had for cycling. He went back to ferocious leg work-outs in the gym, and against doctor’s advice, bought a mountain bike, a Specialized Rockhopper. Reading in the local newspaper that there was to be a downhill and cross country event at Rothbury, Jason entered and had his first taste of mountain bike competition at 17. In his first ever downhill race at Rothbury, riding a bog-standard bike from Halfords, Jason won the novice class, even though still officially a junior, and posted a time that placed him third overall, just behind Pro-Elite riders. He was hooked. He ‘upgraded’ his bike to a Halford’s Carrera and entered as many races as possible, turning in increasingly better performances, culminating in his win at the BOMB MC event – the unofficial British Championship at a course near Scarborough. His determination and manner off the bike won him many admirers, and with the help of Brant Richards secured his first sponsorship deal with NTI. 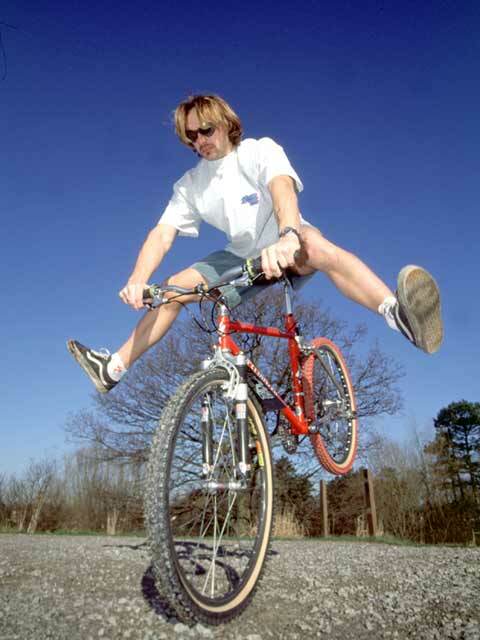 In 1992 Jason became a Team MBUK rider, but incurred the wrath of many UK sponsors by choosing to ride in race in Europe, rather than on the UK circuit. In a thrilling Grundig Supercup race at Lillehammer in Norway, he was within striking distance Phillipe Perakis when his chain snapped, leaving him to coast the last mile home. He competed in the pre-cursor to what is now the Grundig World Cup Downhill Series, coming tenth overall. Despite his tenth-in-the-world ranking, Jason was unable to pick up a decent sponsorship deal for 93. This was because he had committed the cardinal sin of racing abroad, that plus the fact that he lived in the unfashionable North of England and was a downhiller of all things; after all, real mountain biking was cross country wasn’t it? Without a sponsorship deal in 1993 his parents quit their jobs to travel with Jason and fund his racing in the newly-inaugurated Grundig World Cup Downhill. They had managed to secure a bike and bits deal from Hardisty Cycles, but travelling by air meant they were limited in what they could carry with them. After finishing 7th at the downhill at Cap d Ail, near Nice they flew to the States. First stop was Vail, site of the ’94 Worlds. He didn’t win, but was the fastest through the speed trap, earning him his precious Tag watch, which his father still has today. A bit of telephonic persuasion by his mum had got him an entry for the Eliminator in California and that was their next stop. It was there that he earned his big break, riding down the infamous Kamikaze course in his skin suit against armoured riders. His mechanical back-up was one spare tyre carried by Rory Hitchens at the bottom and two spare inner tubes, compared with full mechanical, and even spare bike back up enjoyed by the other riders. The night before the Eliminator, his father had to go begging to the GT truck for a rear triangle for the RTS, as the one on the bike had cracked under the strain of the season’s racing. They gave him one which had come off a team bike and had been replaced as part of their ongoing maintenance program. The GT finally gave up the ghost at Hunter Mountain in New York, when the top tube parted company from the rest of the bike. His ‘cautious’ run with the broken bike was enough to give him seventh spot. Returning tired but victorious to the UK, he wrapped up his season by grabbing his first national downhill title. The last Grundig was in Kaprun, where his ninth placing left him with an overall ranking of ten. The World’s in Metabief were a total disaster for him – he crashed, and was disqualified for leaving and entering the course at different places. His first Pro year was with Specialized USA in ’94. It was an indifferent year fraught with mechanical problems of all kinds -cleats pulling out of shoes, shocks blowing, wheels failing, and its highlight was him retaining his National jersey. In his fourth year as Britain’s downhill representative in the World’s at Vail, he once again crashed in the final. People began to think that there was some kind of jinx on Jason for the World’s. 1995 started disastrously. In an effort to support the sport in the UK, Jason agreed to ride some of the Karrimor series. On an abysmally wet Peckforton course, he slipped and dislocated his thumb. In the following race, the BMB, still suffering the effects of the dislocation, he crashed and broke his wrist, which effectively took him out of the first two Grundig Downhills. Ever the optimist, he realised that he could still ride his road bike without damaging his wrist and so took up track racing at the Manchester Velodrome to maintain his fitness. His results were astonishing, and the England coach Doug Daley began to take an interest. The upshot of this was that Jason was short-listed as a possible Olympic track rider for Atlanta. 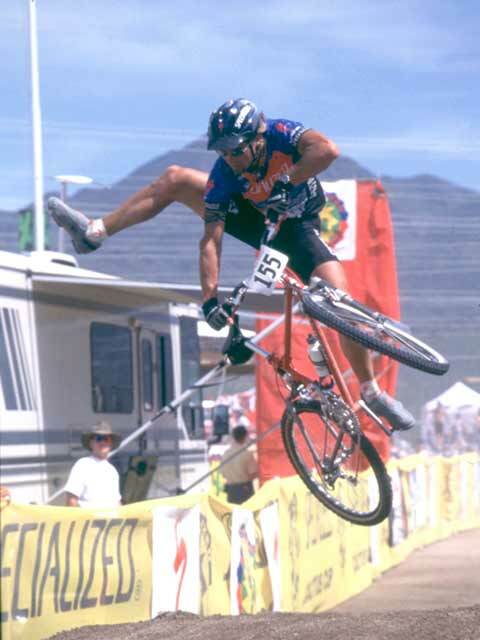 All he really needed was his raw power and tactics refining and there was a good chance he would be riding for his country in a different discipline to mountain biking in ’96. Returning home for the Nationals, Jason went to the course to prepare to defend his jersey. Two days before the race he crashed badly and had broken two ribs. He was still second in the Nationals and although he was first to congratulate the winner Will Longden, he was very disappointed at not being able to keep his championship. Jason McRoy died tragically on August 24 1995, when his Harley Davison motorbike was in collision with a lorry at Woodhead Pass on the A628 in Derbyshire. This isn’t really the end of the story though, A month later, his father smuggled two film canisters containing Jason’s ashes across to the World’s in Germany, where he became the first and last rider to get two runs down the downhill in the World Championship final, the first on Rob Warner’s bike and the second on Steve Peat’s. In 1996 Jason’s ashes went to the World’s in Cairns, Australia, some being scattered on the Great Barrier Reef, some in the rain forest, and more went down the downhill on board with some of the top riders in the World. The same happened in 1997 at the World’s in Chateau d’Oeux in Switzerland. Jason’s parents, Jim and Rose, built a small memorial at the crash site at Woodhead Pass which we and scores of mountain bikers’ visit, often leaving small tributes tied to the fence: – necklaces, chain rings, mechs from bikes, his family feel touched that people remember Jason in this way. He may be gone, but his spirit still lives on in the people he inspired to ride. RIP Jason. A massive thank you to Jason’s father, James E McRoy, for allowing us to use the photos and access to the information on his site. All photographs are copyright of James E McRoy.